SOLD- ASK ABOUT THE OTHER ONE AT THE SAME PRICE. Fossil Jellyfish. Aff: Hiemalora Stellaris, from the Lower Upper Cambrian Period. 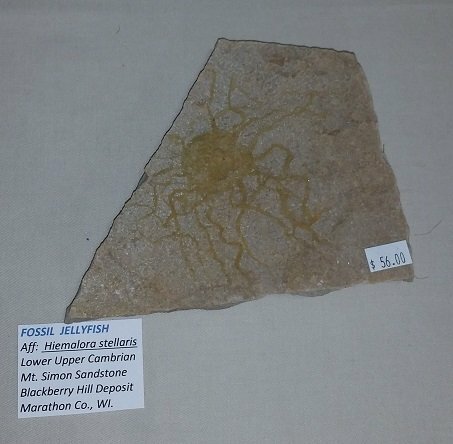 It comes from the Mount Simon Sandstone Blackberry Hill Deposit in Marathon County, WI. There is a very nice single Fossil Jellyfish on this plaque which measures approximately 6 1/2" X 5 1/2" X 1".